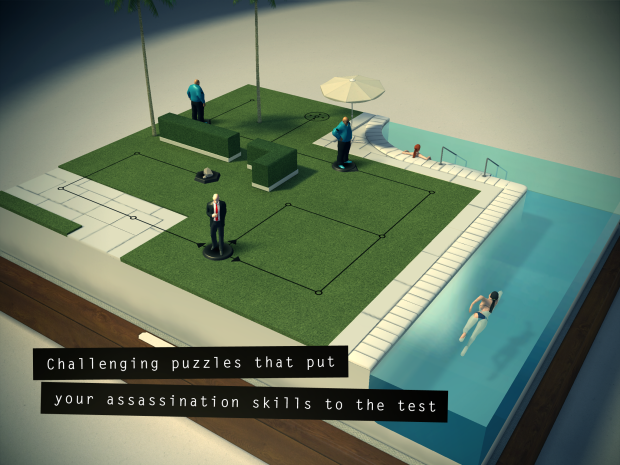 Hitman Go isn’t a traditional Hitman game in many ways, but it still manages to capture the spirit of the franchise more successfully than the most recent sequel in the main series. Hitman: Absolution may have been all about adding more drama and action to the long-running stealth series, but that isn’t what Hitman games are usually all about. They have traditionally been more cerebral and patient affairs, and those terms could certainly be used to describe Go, which is a turn-based puzzle game. 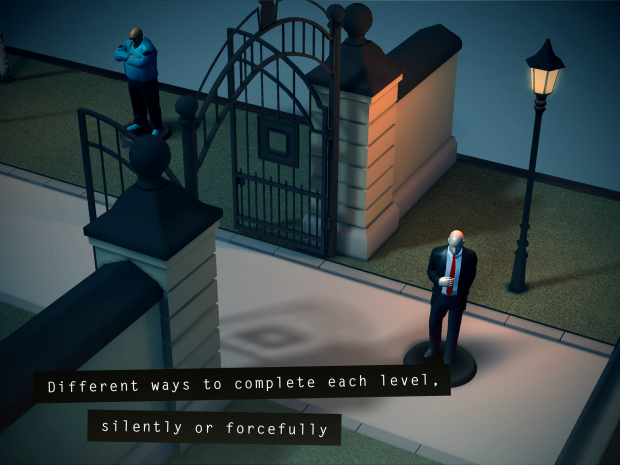 Perhaps it is not the most logical step from assassin-simulator to puzzler, but Hitman Go takes a new concept and imbues it with many features that allow it to successfully recreate a similar atmosphere or mood as previous Hitman games. Developed by Square Enix Montreal, rather than the usual IO Hitman team, Go started life at the studio as a card-based table-top game – even then the team saw potential in the simple fun of applying Agent 47 and his questionable career choice to the world of board games. Go consists of five different boxes – more is coming soon – and each one is styled as an individual board game, which are unlocked as you successfully complete earlier levels. These are then made up of around fifteen smaller stages, which start off as simple tutorial levels, and slowly ramp up into quite intricate puzzles that will require a lot of planning to tackle successfully. You play as Agent 47 and can move about pre-determined routes on each board. The aim is to avoid guards, collect packages and exit each stage, with assassinations thrown in for good measure. This is all achieved with turn-based play, where moving your playing piece one space also moves your enemies immediately after. This, of course, depends on the level, as some guards are stationary; some simply rotate from looking one way to the other, and others actively move about the level along set routes. This is where the trial and error enters the equation, as you will need to watch the the movements of the enemies in order to work out how to best avoid them. You can assassinate regular guards, but only by moving your piece onto the same spot as theirs. If they move onto your spot, it is curtains for 47. There is a very slow and steady learning curve to the levels easing players into the game, as well as reserving extra features until later stages. Unfortunately, this does lead to the game feeling a little simplistic for much of the first levels. You won’t gain access to weapons or environmental kills until the third set at the earliest, and there are new variations of enemies and techniques still being introduced until quite late on. Whilst it does mean you may feel a little under-challenged to begin with (or that the game is too shallow), this allows for good variety in stages and for later levels to feel markedly different from early ones. While not seeming similar to the previous games. 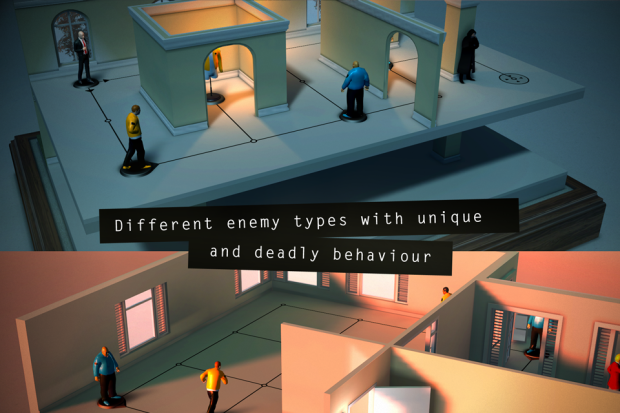 the gameplay does stick to the idea of avoiding guards whilst carefully planning your route of attack. There are even bonuses awarded for completing levels with either no kills, or killing all enemies – as well as completing boards in the fewest moves possible. This is also reminiscent of the challenges within the core Hitman titles, such as trying to pull off a silent Assassin rating, or to neutralise all threats. There is even one set of stages based on the “Curtains Down” theatre level from Hitman: Blood Money, to keep long-time fans happy. This kind of gameplay, although repetitive, does encourage you to keep coming back to the title. You can play and re-play each stage, trying to complete all objectives on offer, and it becomes quite addictive. Knowing that there is some kind of perfect route through each stage is all the motivation you need. If you struggle to achieve this, you can use hints to show you the routes through a level to achieve particular goals, but you only start with five of these, and they can only be replaced through in-app purchases. A little annoying, but the whole game can certainly be unlocked and played through without using these anyway. Square Enix Montreal have managed to capture the style and mood of previous titles. It is almost cute – strange for a game about killing – but each level looks like a tabletop miniature and all of the characters playing pieces in those worlds. It is a clean and simplistic style, that achieves impressive results with minimal effort. You begin to imagine each level in full 3D in your head, and the stages are quite evocative, without needing to include a great level of detail. Add certain Hitman flourishes like the double Silverballer execution animations and the use of series theme “Ave Maria” during assassination stages, and Go still feels like a Hitman game. VERDICT: Hitman Go is a rare breed in mobile games because it doesn’t try to copy another popular title, or provide a lazy spin-off from its source material. In fact, it manages to take an existing license and apply it to an entirely new genre, whilst still managing to maintain the spirit of the original. It may not provide the bloody killing that you might want from an assassination game, but it captures the same sneaking atmosphere and re-packages it into a more mental challenge.